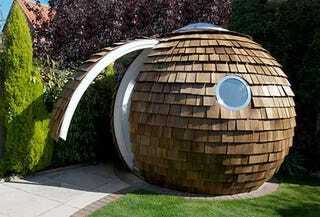 If you want your backyard home office orb to be minimalist and clean on the inside but woodsy and natural on the outside, the Archipod is the pod for you. There's nothing wrong with wanting your sanctuary to take the form of a futuristic pod. But you have to be willing to find one that doesn't disrupt your backyard's harmony with nature. The Archipod, like a coconut, is brown and rugged on the outside but white and smooth when you open it up and look inside. Created in the UK, the Archipod was conceived out of "frustration at the commuting lifestyle, with its attendant road congestion, air and noise pollution, road rage, running costs and time loss."